I have an 815L payment on hold. This isn't making sense to me since all I've done are two surveys for 90 each and have been watching smore.tv. I cashed out the surveys prior to the posting of the new rules. Why is there an 815L payment on hold in my account? This is stopping me from cashing out from the videos and radio. I am just totally lost. I spend so much of my time here and when I look it seems like I didn't get my earnings sometimes. I am learning this part of it. but my payment page I need just a little help on. Tia has been paying out the rewards for years before they get credited with the rewards. As Tia has to wait for the companies to pay him/her, I actually think its a good idea for both parties. We can see the credit building up still. My guess is it's probably retroactive with the new policy in place. is any of the current balance available to withdraw? i/we have spent alot of time doing these surveys and offers and now cant get the ped to actually play the game? Even if it is retroactive for the last month it would not add up to 815L on hold doesn't explain anything. most of what i do is listen to the radio and watch videos. Which the radio and videos are not effected by the new policy. And, I agree what the hell does any of it mean what are we able to withdraw and when? If i try to withdraw right now it says i have a negative balance available to withdraw. The way this is set up is completely messed up with no explanation of how things work now. Underdog, let me start by saying if this sounds rude i apologize. Do you read the posts or just the titles? The new policy has been referenced several times just copy and pasting the link helps no one. Some of you are seeing a negative balance which can be withdrawn. This is because you have made a withdraw recently where your CPA earnings were also paid. Now because the new rule is in effect, the withdrawable balance goes negative. Just wait till 15th (or 17th) of next month and it will be all good. Please try to understand how the payments work. You complete a task here (a micro-task or an offer from CPA). The 3rd party where you did the task notifies us that you completed a task worth X dollars. We credit your account immediately (and any referral commission to someone). Now you can withdraw this money immediately. Now understand the next part. So far we have just received a "notification" from the 3rd party that someone has completed a task worth X dollars; they have not paid us that X dollar. When do we get paid? After 2 months!! All good if we get that money. But at times we do not. Number of frauds are on the rise where people use proxies or other fraudulent methods to complete these offers. We receive charge-backs which are applied to users' accounts but in most cases the users are already gone with the cash. We have 12 users who owe us more than $300, and 173 users in total with negative balance because of such frauds. More than $6000 are lost / stolen to frauds so far. Micro-tasks pay us after 2 months. But they always pay, so the new rule does not apply to those. We have placed it where it was absolutely necessary. You made 2 withdraw in past 2 days. You are right. Most of your transactions are radio/video, but you recorded 2 big CPA in past 2 days and I also see regular smores (CPA again). Hope that explains. It will start looking normal from next month (around 15th). Total balance is what it used to be. Means all your earnings which you have not withdrawn. Earnings on hold are CPA earnings which are not available to withdraw for a month. Available to withdraw is Total Balance - Earnings on Hold. "Earnings on hold" will move to "Available to withdraw" in a month around 15th. okay so it is retroactive. Thank you for the explanation Tia, so as i understand the new policy the payments will now be a month behind because of the cpa offers. are there videos that are not cpa? Follow the Video link just below CPA offers link. Those are in-house videos. Okay, so, I just tried to do a withdraw of L$981.50. 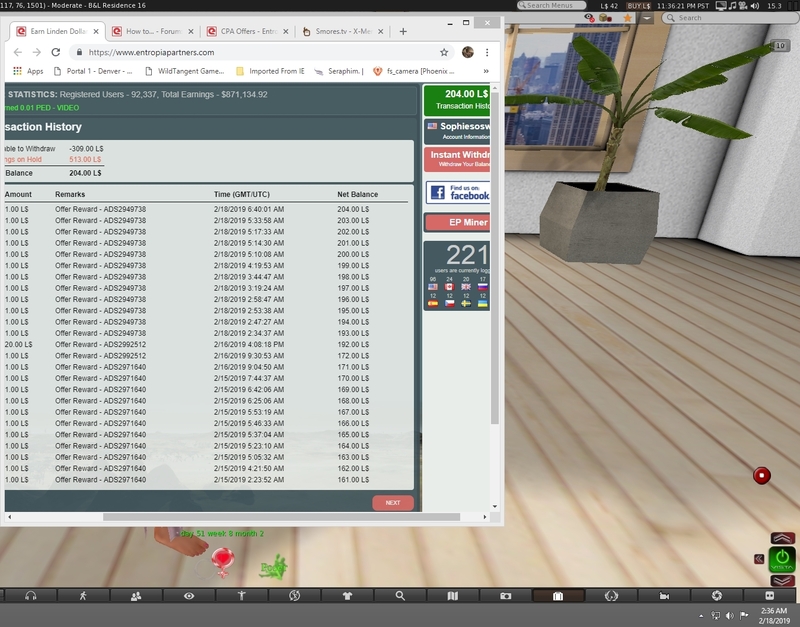 That amount never went into my SL account. Does that mean I have to wait a month to get paid? The payment page clearly tells you how much you can withdraw.